This drawing was made in December 1960 in Melbourne, shortly after Janet Dawson returned to Australia from Europe, courtesy of the National Gallery of Victoria Traveling Scholarship. In Europe she had experienced a direct introduction to contemporary art, which was to have a profound effect on her work, as was the influence of her teacher at the Slade School, Ceri Richards. The latter period of her time abroad was spent in Italy where she lived for some months in the village of Anticoli Corrado in the Sabine Mountains near Rome. "The drawings she produced of the Italian landscape are abstracted lyrical responses to the physical experience of being there. 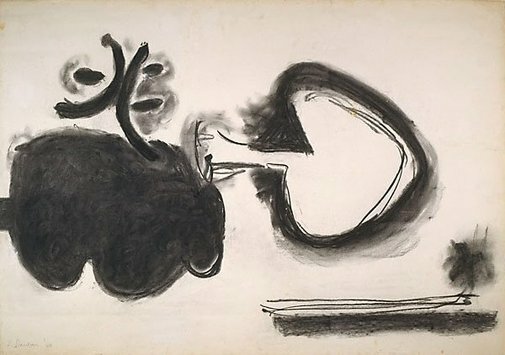 The soft black charcoal shapes are not so much descriptive as sensual renderings of places, hills, trees and folds of valleys ... her use of formal devices of abstraction (are) embedded in a genuine response to the sensations of the landscape itself." Signed and dated l.l., pencil "J. Dawson ´60".